Tyler Huston Sharpe was a member of the last graduating class of La Harpe High School in 2007. He then went to Western Illinois University from 2007-2012 and graduated with a Bachelor of Arts in Design. While finishing school at WIU, he landed an internship in Nashville, TN for a couple months at one of the oldest functioning letterpress studios in the country, Hatch Show Print. 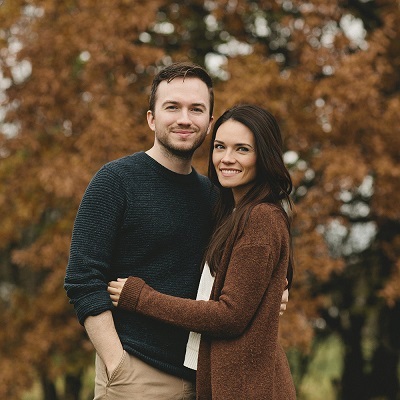 After a stint back home working at Sullivan Auctioneers - and getting married - he and his wife, Natalie, moved to Nashville upon getting a job offer there from a small agency called Caddis Interactive. He worked at Caddis for a couple of years before the company was acquired by a larger agency, Lewis Communications, which had offices in Nashville, Birmingham, and Mobile, Alabama. During that time, he and Natalie moved back to Illinois, to her hometown of Watseka, where he continued to work remote for the company. Tyler says "this year I was offered a new opportunity, also remote, at Health Alliance Medical Plans while Natalie substitute teaches at area schools." Tyler is currently a Senior User Experience Designer for Health Alliance Medical Plans in Champaign-Urbana and says "my role at a high level is to design a great experience for our users. In the case of health insurance, that's helping to design websites and apps that make the process easier for members, healthcare providers, and various partners to the organization. My job allows me to work on bigger strategies and architectures for our services, but to also handle the small details of design such as branding, typography, photography, Illustration, layout, and color. The greatest measure of success in what I do is hearing that our work, websites, or apps make a great impression on the customers that use them." Tyler is pictured with his wife, Natalie, whom he met at WIU in 2009 while they both were pursuing degrees in the Art Department. Tyler says "We happened to sit next to each other in an Art History class, but it wasn't for another year that we would start dating. Funny story, she actually proposed to ME while we were walking to an extra credit event for one of her classes on campus. Having built a connection off of art and weird humor, I wasn't surprised when she handed me - not a ring - but a silly drawing of us getting married. Like an idealistic man, I refused at first and shortly thereafter accepted her offer. Our ceramics teacher said we reminded him of Jim and Pam from The Office. Natalie and I will both be turning 30 this year and our time together so far has been wonderful." "Both Natalie and I have owned a photography business together since 2013 and have photographed many weddings and portraits over that time. This year was a busy wedding season in particular and we photographed a number of weddings together, taking us to Florida, Pittsburg, and Western Illinois. Natalie manages all client communication and post-production (editing) for our work together. Natalie and I connected on the topic of photography when we started dating. We'd always joked about starting a business together, so it's nice that so many years later we're doing it successfully." "In addition to traveling for work last year, Natalie and I drove, with my parents, to Colorado Springs, Colorado for a short family vacation. We also celebrated 5 years of marriage on September 28th, 2018 and treated ourselves to a trip to Los Angeles (our first time in California). We stayed at an Airbnb in the Hollywood Hills, and spent time in places like Venice Beach, Santa Monica Pier, Malibu, Warner Brothers Studios, and Disneyland. Natalie is also a huge fan of game shows and arranged for us to be on Let's Make a Deal our first day there! Attendees wear costumes on the show, so we went as "Peas & Carrots". The episode should air in April of 2019 so look for us!" Tyler and Natalie look forward to having children when the time is right. He says "we don't currently have children; but don't get us wrong, we talk about baby names all the time!" Tyler says the most influential people in his life are his Mom and Dad, Ted and Terri Sharpe of La Harpe. He says "Dad has always been a model for stability, kindness, and sacrifice in my life. He really cares about family, stands firm on what he believes in, and has an interest in whatever his kids are doing with their lives. My Mom has always been the kindest, most gentle person I've ever known, and has spoiled me rotten my whole life. She knows my heart and always has the right thing to say. For someone who has been through a lot, she still manages to put everyone else first and is truly selfless." "P.S. My late Grandmother, Ann Collins, was always a huge support system for me as well and always supported me through my journey in art and my creative profession." A fun fact from Tyler is "On my Dad's side, the Bradshaw's had a big hand in the early days of the Quill. My grandma Mary Belle Sharpe (Bradshaw) operated a linotype machine if anyone remembers those! My time at Hatch Show Print gave me a wider interest in the history of the Quill and my family's involvement in it."